Friday Pie Day is back! I decided to kick off my re-instatement of the wondrous "holiday" with my classic apple pie. It's perfect apple season around here and my favorite local farm market has some truly delicious varieties this year. I took advantage of a playdate there this past week and picked up some winesap apples, which are my favorite kind to use for apple butter and I couldn't resist some honeycrisp ones either, with plans to bake most of them into the pie you see below. 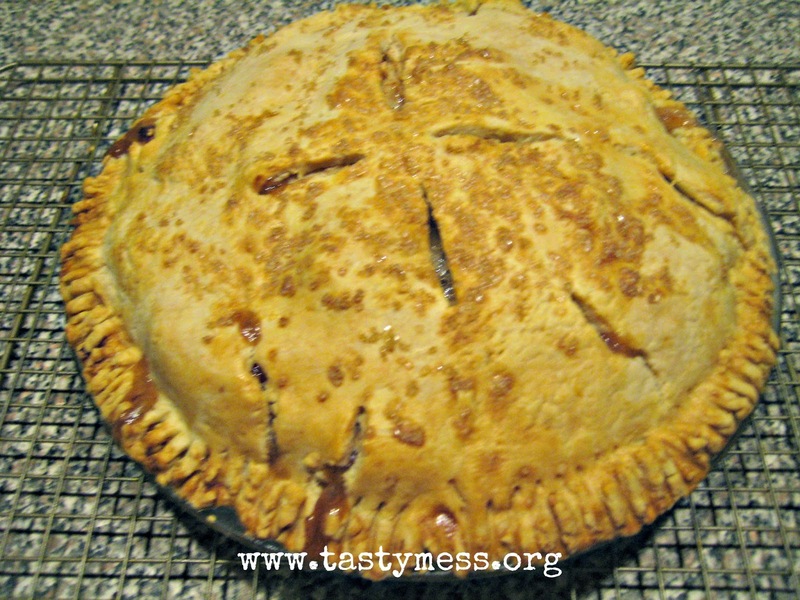 I love a good apple pie and it is so simple to create, honestly the hardest part is finding a great pastry crust recipe and peeling the apples. The crust I use is fantastic and uses a blend of shortening and butter to create a tender and flaky pastry. If you prefer to use all butter instead, this recipe is another one I use that is also delicious. I think my next Friday Pie Day will include a recipe for sweet potato pie, any tips? Dice the butter and return it to the refrigerator to completely chill while assembling the rest of the crust. Add the flour, salt and sugar into the bowl of a food processor, pulse a few times to mix. Add in the butter and shortening, pulse a few times until the butter is worked in and the size of peas. With the food processor running, slowly add in ice water until the dough begins to form a ball. Remove the dough and place on a floured surface, rolling into a large ball. Divide in half and press each into a disc. Wrap each in plastic wrap and refrigerate at least 1 hour before using. Peel and slice the apples thin, about a ¼ inch thick, and place in a large bowl. Toss together sugar, cornstarch, cinnamon, salt and nutmeg, then add it to the apples. Stir well to coat and set aside. Roll out the pastry on well-floured surface until about 1/8 inch thick. Fit into a 9” pie plate and trim to leave about a ¾ inch overhang. Add the apple filling into the crust and dot with the softened butter. Wisk together the egg yolk and 2 tbsp. of water, then brush it on the overhang of the bottom crust before topping with the second crust. Crimp the edges with a fork or your fingers to seal, brush the entire top crust and edges with the egg wash and sprinkle with raw sugar. Cut a few slits in the top to vent the steam. Place the pie on a rimmed baking sheet and bake for 20 minutes with the oven at 425, then reduce the temperature to 350 and bake for another 60 minutes. Let cook at least 20-30 minutes before serving warm or at room temperature.